Gadbaw playing a folksong game with children. Beth Gadbaw and Margot Krimmel are both experienced, respected teachers. They are available as a duo or as solo artists to teach workshops and lessons. Fulbright scholar, singer, and teacher Beth Gadbaw has taught at the Milwaukee Irish Festival, the Kansas City Irish Festival, the National Music Edventures Conference, and more. Equally skilled in teaching children and adults, she believes that singing is an integral part of human development. Gadbaw’students develop technical and performative skills, learn a repertoire of folksongs through group and individual participation, and endeavor to become more expressive, confident singers. Classes Gadbaw has taught include sean-nos singing, ballad singing, folksinging for children, and song arranging. Gadbaw also teaches bodhran. 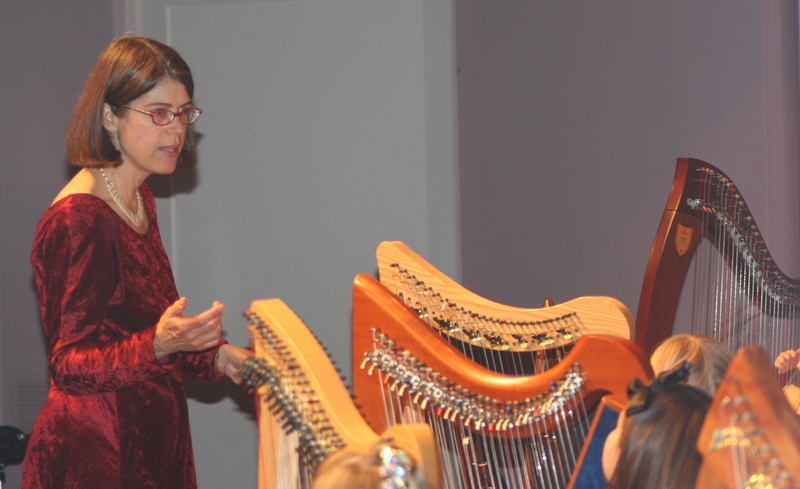 Award-winning composer, harpist and teacher Margot Krimmel has taught at Rocky Mountain Fiddle Camp, Naropa University, and at Colorado Academy school for the arts. She runs an active studio from her home in Boulder, teaching over 25 private students of all ages. Krimmel’s harp teaching is based in Suzuki and Orff practices, developed even more fully by her own creativity and passion for teaching. Krimmel composes unique arrangements through which her students develop their skills, and offers performance opportunities to students of all levels, inspiring excellence, musicality, creativity, and performative and technical skill.